With tickets officially on sale for the 2017 event, we’re stepping back for a moment to reflect. Why are we doing this? Is it for fame? Fortune? Nope. What do we envision the future of TEDx South Lake Tahoe to look like? With a resounding answer, we want to make this event a mantelpiece for our community! A showcase not only to encourage & support the talented, ‘difference-making’ individuals living in our region but also to be one of the GREATEST locales to hold a thought-provoking affair. But, we cannot do this without the express support from you! When we embarked on this journey in 2016, it was to see how South Lake Tahoe would react. It was exciting to experience such a great response from the area. It reinforced our belief that there was in fact a need for a positive platform to share ideas and concepts. So, what do we foresee in the future? Our vision is simple… to sustainably grow this experience and make it the biggest event possible! How? For starters, this year we’ve doubled the capacity & increased the number of speakers. Next, we’d love to see it expand even further by transforming from an evening event to a full day extravaganza. We also want to present grander ideas that will lead to greater action in our community. So, how can we make this happen? 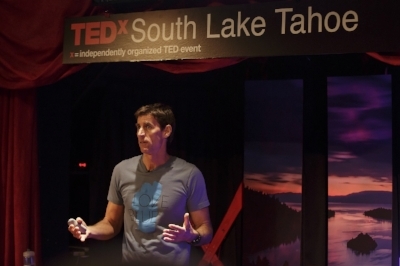 For those unaware, the TEDx South Lake Tahoe board is comprised of people doing this as a labor of love. We’re not making any money, and in fact, besides donating our personal time, we’ve provided capital to make it happen. This means for us to expand in the future we need additional sponsors. So, if you own a business or just want to help grow the program, please contact us! No matter where we go from here, we’re excited to have you join us at the 2017 event!